You've found the “U.S. 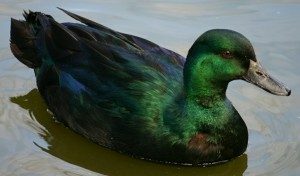 Black East Indian Duck Breeders” page here at Hobby Farm Wisdom! If this is the first time you have visited our site: Welcome! The oldest bantam breed, the Black East Indian ducks are originally from America and were named like they are in efforts to sell due to their exotic and beautiful plumage. They have jet black bills and an iridescent beetle green color that plays well with the light. This color gene is also shared with the Cayuga breed. Females of this breed will get white feathers as they age and they lay unusual black or dark grey eggs that will fade to light grey or blue as egg laying season ends. They can lay around 10-100 eggs a year. The drakes will always remain black. Ducks will weigh around 1.5 lbs and drakes up to 2 lbs, and thanks to be so lightweight, they are considered good fliers. The Black East Indian ducks are primarily used for exhibition or decorative purposes.